Westbourne Motorsport marked their return to Renault UK Clio Cup action with an eighth podium finish of the 2018 campaign last weekend [28-29 July] at Snetterton. 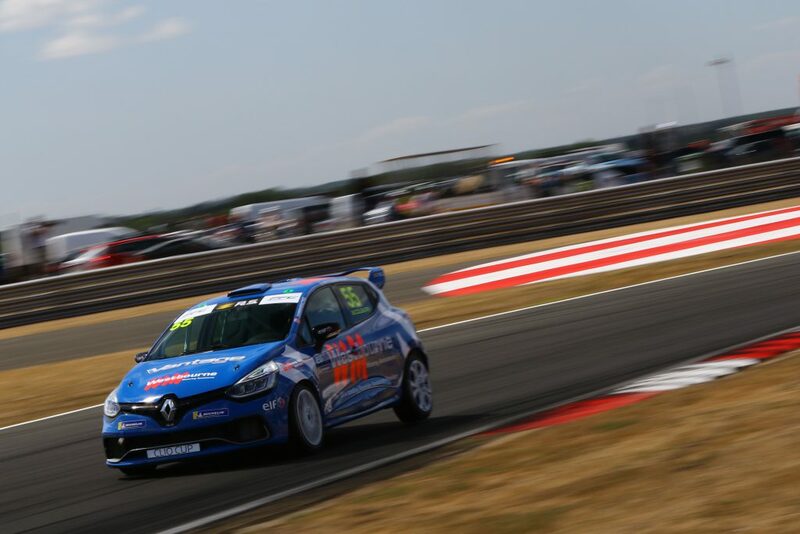 Bolstered by the addition of Michelin Clio Cup Series ace Ben Colburn, the Worthing-based outfit translated their front-running pace in practice into a third pole position of the season in the hands of BRDC Rising Star and title contender James Dorlin. Siblings James and Ben marked their own slice of UK Clio Cup history as the first siblings to race in the nation’s most competitive single-make category by sharing the sixth row. Treacherous conditions unravelled the team’s push in the opening contest, with Dorlin sliding wide at Wilson after a spectacular early-race battle with privateer Daniel Rowbottom. In recovering to take the chequered flag eighth the Barnsley-based racer gained points on championship leader Max Coates and – courtesy of his fastest lap – matched fellow title rival Paul Rivett’s score in a damage limitation exercise. An unfortunate gearbox problem ruled Ben out of contention moments before his debut, but in his stead 2011 championship runner-up James came home to register another consistent top ten finish. Beamed live nationwide through ITV Sport’s free-to-air television coverage in addition to a hardy trackside crowd braving the poor weather conditions, Dorlin once again led the team’s charge from the front row in race two. Though he led the first half of the race, Coates made a move stick at Nelson’s to claim top spot, though Dorlin consoled himself with a seventh trip to the rostrum of the campaign. A superb on-track battle with BMR’s Bradley Burns and the returning Ash Hand earned James seventh at the chequered flag, with Ben scoring his maiden championship points in 13th – keeping behind ex-British Touring Car Championship racers Mike Epps and Clio Cup Series runner-up Brett Lidsey behind in the process. The team heads next to Rockingham Motor Speedway over the weekend of August 11-12 as the title race starts to narrow, with further events at Silverstone and Brands Hatch set to decide the destiny of the 2018 title. James Colburn (#7) said, “Qualifying proved difficult as we struggled to extract the most from the car, but the races were far more interesting with constantly changing weather conditions. “In the first race a very slippery entrance into Wilsons caught us out and we dropped back to last, but we demonstrated how strong our pace was after that by recovering to tenth. “We enjoyed a much better result from race two but the car felt completely different, and unfortunately the pace wasn’t quite there to get closer to the front-runners. James Dorlin (#32) said, “Overall, it hasn’t been a bad weekend. We’ve closed on the top two in the championship, which is what we needed to do, and we’ve come away with another strong podium. “Despite this, I feel we should have been celebrating a victory in race one, but everyone makes the smallest of mistakes from time to time, and that one punished me greatly. It’s only made me more determined to put in a good showing for the final six rounds. Ben Colburn (#55) said, “Everything started better than I had expected – especially being able to qualify alongside James and in the mix with everyone. It boosted my confidence a lot more and left me excited for the races. “An issue with the car stopped us from taking part in the opening race but these things happen. I made an OK start in race two and battling in the midfield proved to me I can race with more experienced drivers like Mike [Epps], and being able to beat him has definitely continued to build up my confidence.